"Kaltenbrunner" redirects here. For people with the surname, see Kaltenbrunner (surname). Born in Ried im Innkreis, Austria, Kaltenbrunner was the son of a lawyer, and was educated at the Realgymnasium in Linz. Raised in a nationalist family, Kaltenbrunner was childhood friends with Adolf Eichmann, the infamous SS officer who played a key role in implementing the Nazis' Final Solution against Europe's Jews. After Gymnasium, Kaltenbrunner went on to obtain his doctorate degree in law at Graz University in 1926. He worked at a law firm in Salzburg for a year before opening his own law office in Linz. He had deep scars on his face from dueling in his student days, although some sources attribute them to an automobile accident. On 14 January 1934, Kaltenbrunner married Elisabeth Eder (b. 1908) who was from Linz and a Nazi Party member. They had three children. In addition to the children from his marriage, Kaltenbrunner had twins, Ursula and Wolfgang, (b. 1945) with his long-time mistress Gisela Gräfin von Westarp (née Wolf). All the children survived the war. On 18 October 1930, Kaltenbrunner joined the Nazi Party with NSDAP member number 300,179. In 1931, he was the Bezirksredner (district speaker) for the Nazi Party in Oberösterreich. Kaltenbrunner went on to join the SS on 31 August 1931, his SS number was 13,039. He first became a Rechtsberater (legal consultant) for the party in 1929 and later held this same position for SS Abschnitt (Section) VIII beginning in 1932. That same year, he began working at his father's law practice and by 1933 was head of the National-Socialist Lawyers' League in Linz. In January 1934, Kaltenbrunner was briefly jailed at the Kaisersteinbruch detention camp with other National Socialists for conspiracy by the Engelbert Dollfuss government. While there he led a hunger strike which forced the government to release 490 of the party members. In 1935, he was jailed again on suspicion of high treason. This charge was dropped, but he was sentenced to six months imprisonment for conspiracy and he lost his license to practice law. From mid-1935 Kaltenbrunner was head of the illegal SS Abschnitt VIII in Linz and was considered a leader of the Austrian SS. To provide Heinrich Himmler, Reinhard Heydrich and Heinz Jost with new information, Kaltenbrunner repeatedly made trips to Bavaria. Hiding on a train and on a ship that traveled to Passau, he would return with money and orders for Austrian comrades. Kaltenbrunner was arrested again in 1937, by Austrian authorities on charges of being head of the illegal Nazi Party organisation in Oberösterreich. He was released in September. Acting on orders from Hermann Göring, Kaltenbrunner assisted in the Anschluss with Germany in March 1938, and was awarded the role as the state secretary for public security in the Seyss-Inquart cabinet. Controlled from behind the scenes by Himmler, Kaltenbrunner still led, albeit clandestinely, the Austrian SS as part of his duty to 'coordinate' and manage the Austrian population. Then on 21 March 1938, he was promoted to SS-Brigadeführer. He was a member of the Reichstag from 10 April 1938 until 8 May 1945. Amid this activity, he helped establish the Mauthausen-Gusen concentration camp near Linz. Mauthausen was the first Nazi concentration camp opened in Austria following the Anschluss. On 11 September 1938, Kaltenbrunner was promoted to the rank of SS-Gruppenführer, equivalent to a lieutenant general in the army while holding the position of Führer of SS-Oberabschnitt Österreich (re-designated SS-Oberabschnitt Donau in November 1938). Also in 1938, he was appointed High SS and police leader (Höherer SS- und Polizeiführer; HSSPF) for Donau, which was the primary SS command in Austria (he held that post until 30 January 1943). In June 1940, Kaltenbrunner was appointed Police President of Vienna and held that additional post for a year. In July 1940, he was commissioned as a SS-Untersturmführer in the Waffen-SS Reserve. Throughout the course of his many duties, Kaltenbrunner also developed an impressive intelligence network across Austria moving south eastwards, which eventually brought him to Himmler's attention for the assignment as chief of the RSHA in January 1943. The RSHA was composed of the SiPo (Sicherheitspolizei; the combined forces of the Gestapo and Kripo) along with the SD (Sicherheitsdienst, Security Service). He replaced Heydrich, who was assassinated in June 1942. Kaltenbrunner held this position until the end of the war. Hardly anyone knew Kaltenbrunner and upon his appointment, Himmler transferred responsibility for both SS personnel and economics from the RSHA to the SS Main Economic and Administrative Office. Nonetheless, he was promoted to SS-Obergruppenführer und General der Polizei on 21 June 1943. He also replaced Heydrich as President of the International Criminal Police Commission (ICPC), the organization today known as Interpol. Fear of a collapsing home-front due to the Allied bombing campaigns and that another "stab-in-the-back" at home could arise as a result, caused Kaltenbrunner to immediately tighten the Nazi grip within Germany. From what historian Anthony Read relates, Kaltenbrunner's appointment as RSHA chief came as a surprise given the other possible candidates like head of the Gestapo, Heinrich Müller, or even SD foreign intelligence chief, Walter Schellenberg. Historian Richard Grunberger also added the name of Dr. Wilhelm Stuckart, the future minister of the German Interior as another potential candidate for head of the RSHA; however, he suggests that Kaltenbrunner was most likely selected since he was a comparative "newcomer" who would be more "pliable" in Himmler's hands. Like many of the ideological fanatics in the regime, Kaltenbrunner was a committed anti-Semite. According to former SS-Sturmbannführer Hans Georg Mayer, Kaltenbrunner was present at a December 1940 meeting among Hitler, Goebbels, Himmler, and Heydrich where it was decided to gas all Jews incapable of heavy physical work. Under Kaltenbrunner's command, the persecution of Jews picked up pace as "the process of extermination was to be expedited and the concentration of the Jews in the Reich itself and the occupied countries were to be liquidated as soon as possible." Kaltenbrunner stayed constantly informed over the status of concentration camp activities, receiving periodic reports at his office in the RSHA. In an effort to combat homosexuality across the greater Reich, Kaltenbrunner pushed the Ministry of Justice in July 1943 for an edict mandating compulsory castration for anyone found guilty of this offense. While this was rejected, he still took steps to get the army to review some 6,000 cases to prosecute homosexuals. During the summer of 1943, Kaltenbrunner conducted his second inspection of the Mauthausen-Gusen concentration camp. 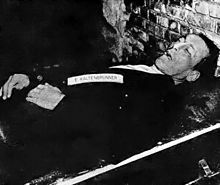 While he was there, 15 prisoners were selected to demonstrate for Kaltenbrunner three methods of killing; by gunshot to the neck, hanging, and gassing. After the killings were performed, Kaltenbrunner inspected the crematorium and later the quarry. In October 1943, he told Herbert Kappler, the head of German police and security services in Rome, that the "eradication of the Jews in Italy" was of "special interest" for "general security." Four days later, Kappler's SS and police units began rounding up and deporting Jews by train to Auschwitz concentration camp. In 1944 when Hitler was in the process of strong-arming Admiral Horthy into submitting Hungary to the Nazis during an arranged meeting in Klessheim Castle in Salzburg, Kaltenbrunner was present for the negotiations and escorted him out once they were over. Accompanying Horthy and Kaltenbrunner on the journey back to Hungary was Adolf Eichmann, who brought with him a special Einsatzkommando unit to begin the process of "rounding up and deporting Hungary's 750,000 Jews." Immediately in the wake of the 20 July Plot on Hitler's life in 1944, Kaltenbrunner was summoned to Hitler's wartime headquarters at the Wolfsschanze (Wolf's Lair) in East Prussia to begin the investigation into who was responsible for the assassination attempt. Once it was revealed that an attempted military coup against Hitler had been launched, Himmler and Kaltenbrunner had to tread carefully, as the military was not under the jurisdiction of the Gestapo or the SD. Since the attempt failed, the conspirators were soon identified. An estimated 5,000 people were eventually executed, with many more sent to concentration camps. Kaltenbrunner (front row, second from left) as spectator at a People's Court show trial following the failed 20 July plot. Historian Heinz Höhne counted Kaltenbrunner among fanatical Hitler loyalists and described him as being committed "to the bitter end." Field reports from the SD in October 1944 about deteriorating morale in the military prompted Kaltenbrunner to urge the involvement of the RSHA in military court-martial proceedings, but this was rejected by Himmler who thought it unwise to interfere in Wehrmacht (army) affairs. In December 1944, Kaltenbrunner was granted the additional rank of General of the Waffen-SS. On 15 November 1944 he was awarded the Knights Cross of the War Merit Cross with Swords. In addition, he was awarded the NSDAP Golden Party Badge and the Blutorden (Blood Order). Using his authority as Chief of the RSHA, Kaltenbrunner issued a decree on 6 February 1945 that allowed policemen to shoot "disloyal" people at their discretion, without judicial review. On 12 March 1945, a meeting took place in the Vorarlberg between Kaltenbrunner and Carl Jacob Burckhardt, president of the International Committee of the Red Cross (1945–48). Just over a month later, Himmler was informed that SS-Obergruppenführer (general) Karl Wolff had been negotiating with the Allies for the capitulation of Italy. When questioned by Himmler, Wolff explained that he was operating under Hitler's orders and attempting to play the Allies against one another. Himmler believed him, but Kaltenbrunner did not and told Himmler that an informant claimed Wolff also negotiated with Cardinal Schuster of Milan and was about to surrender occupied Italy to the Allies. Himmler angrily repeated the allegations and Wolff, feigning offense, challenged Himmler to present these statements to Hitler. Unnerved by Wolff's demands, Himmler backed down, and Hitler sent Wolff back to Italy to seek better terms with the U.S. forces. In mid-April 1945, three weeks before the war ended, Himmler named Kaltenbrunner commander-in-chief of those remaining German forces in Southern Europe. Kaltenbrunner attempted to organize cells for post-war sabotage in the region and in Germany, but accomplished little. Hitler made one of his last appearances on 20 April 1945 outside the subterranean Führerbunker in Berlin, where he pinned medals on boys from the Hitler Youth for their bravery. [b] Kaltenbrunner was among those present, but realizing the end was near, he then fled from Berlin. On 12 May 1945 Kaltenbrunner was apprehended along with his adjutant, Arthur Scheidler, and two SS guards in a remote cabin at the top of the Totes Gebirge mountains near Alt Aussee by a search party initiated by the 80th Infantry Division, Third U.S. Army. Information had been gained from Johann Brandauer, the assistant burgermeister of Alt Aussee, that the party was hiding out with false papers in the cabin. This was supported by an eyewitness sighting by the Alt Aussee mountain ranger five days earlier. Special Agent Robert E. Matteson from the C.I.C. Detachment organized and led a patrol consisting of Brandauer, four ex-Wehrmacht soldiers, and a squad of US soldiers to effect the arrest. The party climbed over mountainous and glacial terrain for six hours in darkness before arriving at the cabin. Matteson confronted the suspects alone and unarmed. After a short standoff, all four men exited the cabin and surrendered without a shot fired. Kaltenbrunner claimed to be a doctor and offered a false name. However, upon their arrival back to town his mistress, Countess Gisela von Westarp, chanced to spot him as he was being led away, called out his name and rushed to hug him. This action resulted in his positive identification and arrest by US troops. Kaltenbrunner wheeled into court during the Nuremberg trials after a brain haemorrhage during interrogation. At the Nuremberg trials, Kaltenbrunner was charged with conspiracy to commit crimes against peace, war crimes and crimes against humanity. Due to the areas over which he exercised responsibility as an SS general and as chief of the RSHA, he was acquitted of crimes against peace, but held responsible for war crimes and crimes against humanity. During the initial stages of the Nuremberg trials, Kaltenbrunner was absent because of two episodes of subarachnoid hemorrhage, which required several weeks of recovery time. After his health improved, the tribunal denied his request for pardon. When he was released from a military hospital he pleaded not guilty to the charges of the indictment against him. Kaltenbrunner said all decrees and legal documents which bore his signature were "rubber-stamped" and filed by his adjutant(s). He also said Gestapo Chief Heinrich Müller had illegally affixed his signature to numerous documents in question. Kaltenbrunner argued in his defense that his position as RSHA chief existed only theoretically and said he was only active in matters of espionage and intelligence. He maintained that Himmler, as his superior, was the person actually culpable for the atrocities committed during his tenure as chief of the RSHA. Kaltenbrunner also asserted that he had no knowledge of the Final Solution before 1943 and went on to claim that he protested against the ill-treatment of the Jews to Himmler and Hitler. Further denials from Kaltenbrunner included statements that he knew nothing of the Commissar Order and that he never visited Mauthausen concentration camp, despite documentation of his visit. At one point, Kaltenbrunner went so far as to avow that he was responsible for bringing the Final Solution to an end. Excerpt from Ernst Kaltenbrunner's closing statement at the Nuremberg Trials. On 30 September 1946, the International Military Tribunal found Kaltenbrunner not guilty of crimes against peace, but guilty of war crimes and crimes against humanity (counts three and four). On 1 October 1946, the IMT sentenced him to death by hanging. Kaltenbrunner was executed on 16 October 1946, around 1:15 a.m., in Nuremberg. His body, like those of the other nine executed men and that of Hermann Göring (who committed suicide the previous day), was cremated at the Eastern Cemetery in Munich and the ashes were scattered in a tributary of the River Isar. ^ This mission was thwarted by Soviet intelligence agent Gevork Vartanian. See the following article: "Armenian intelligence agent, hero of the Soviet Union Gevorg Vardanian passed away". ^ See: "Hitler - Last Known Film Footage". AwesomeStories.com. ^ Gerwarth 2012, p. 100. ^ a b Miller 2015, pp. 393, 394. ^ Snyder 1976, p. 189. ^ "The Nuremberg Trials". Archived from the original on 2001-03-12. Retrieved 2016-04-18. ^ Miller 2015, pp. 408, 409. ^ a b c d e f g h i j k l Miller 2015, p. 393. ^ a b Miller 2015, p. 394. ^ Miller 2015, pp. 394, 395. ^ Rosmus 2015, p. 52. ^ a b Miller 2015, p. 395. ^ Zentner & Bedürftig 1991, p. 487. ^ Read 2005, pp. 461. ^ a b Miller 2015, pp. 393, 395. ^ Stackelberg 2007, p. 215. ^ a b Miller 2015, pp. 393, 396. ^ Wistrich 1995, p. 135. ^ Longerich 2012, pp. 470, 661. ^ Höhne 2001, p. 553. ^ Gerwarth 2012, p. 289. ^ Read 2005, p. 798. ^ Grunberger 1993, p. 98. ^ Breitman 1994, pp. 81–82. ^ Yahil 1990, p. 406. ^ Kahn 1978, p. 270. ^ Evans 2010, p. 536. ^ Miller 2015, pp. 396–398. ^ a b Miller 2015, p. 398. ^ Read 2005, p. 825. ^ West 2013, pp. 140–141. ^ Read 2005, p. 833. ^ Read 2005, pp. 833–837. ^ Graber 1978, p. 180. ^ Höhne 2001, p. 511. ^ Höhne 2001, pp. 542–543. ^ Miller 2015, pp. 393, 406, 407. ^ Overy 2010, p. 388. ^ Moorehead 1999, pp. 458–460. ^ Höhne 2001, p. 572. ^ Höhne 2001, p. 573. ^ Höhne 2001, pp. 573–574. ^ Höhne 2001, p. 574. ^ "The Last Days of Ernst Kaltenbrunner — Central Intelligence Agency". www.cia.gov. ^ Read 2005, pp. 891–892. ^ Janes, Terry D. "The Nazi Redoubt-Patton's Troubleshooters By Terry D. Janes". www.thetroubleshooters.com. ^ ": Gräfin Gisela von Westarp". 1 March 1947 – via Spiegel Online. ^ Leidig, Michael (16 November 2001). "Nazi chief's seal found in Alpine lake" – via www.telegraph.co.uk. ^ Snyder 1976, p. 190. ^ Marrus 1997, pp. 64–70. ^ Conot 2000, pp. 95–96. ^ Conot 2000, pp. 367–368. ^ Marrus 1997, p. 214. ^ Conot 2000, pp. 364–365. ^ Conot 2000, p. 370. ^ Marrus 1997, p. 237. ^ a b c d e f g h i j k Miller 2015, pp. 406, 407. Evans, Richard (2010). The Third Reich at War. New York: Penguin. ISBN 978-0-14311-671-4. Grunberger, Richard (1993). Hitler’s SS. New York: Dorset Press. ISBN 978-1-56619-152-4. Manvell, Roger; Fraenkel, Heinrich (2011). Goering: The Rise and Fall of the Notorious Nazi Leader. New York: Skyhorse Publishing. ISBN 978-1-61608-109-6. Marrus, Michael R. (1997). The Nuremberg War Crimes Trial, 1945–46: A Documentary History. Boston: Bedford Books. ISBN 978-0-31213-691-8. Miller, Michael (2015). Leaders of the SS and German Police, Vol. 2. San Jose, CA: R. James Bender. ISBN 978-19-329-7025-8. Moorehead, Caroline (1999) . Dunant's Dream: War, Switzerland and the History of the Red Cross. Carroll & Graf Publishing. ISBN 978-0786706099. Rosmus, Anna (2015). Hitlers Nibelungen: Niederbayern im Aufbruch zu Krieg und Untergang (in German). Grafenau: Samples Verlag. ISBN 978-3-93840-132-3. West, Nigel (2013). Historical Dictionary of World War II Intelligence. Lanham, MD: Scarecrow Press). ISBN 978-0-81085-822-0. Yahil, Leni (1990). The Holocaust: The Fate of European Jewry, 1932–1945. Oxford and New York: Oxford University Press. ISBN 0-19-504522-X. Wikimedia Commons has media related to Ernst Kaltenbrunner.